One way to help other writers is to read their work and respond to it. If you fill out a response sheet like the one above, you can focus your ideas and respond in the best way possible. If you are the writer . . .
Come prepared with a draft you are working on. Start with a brief introduction of your writing. Then read a copy of your draft out loud and/or have your partner read it silently. If you are the responder . . . Carefully listen to and/or read the draft. Answer the writer’s immediate questions. Complete a response sheet to organize your ideas. Then comment aloud about the writing. Tell what parts you like and suggest ways to make the writing even better. Always be kind and polite in your remarks. 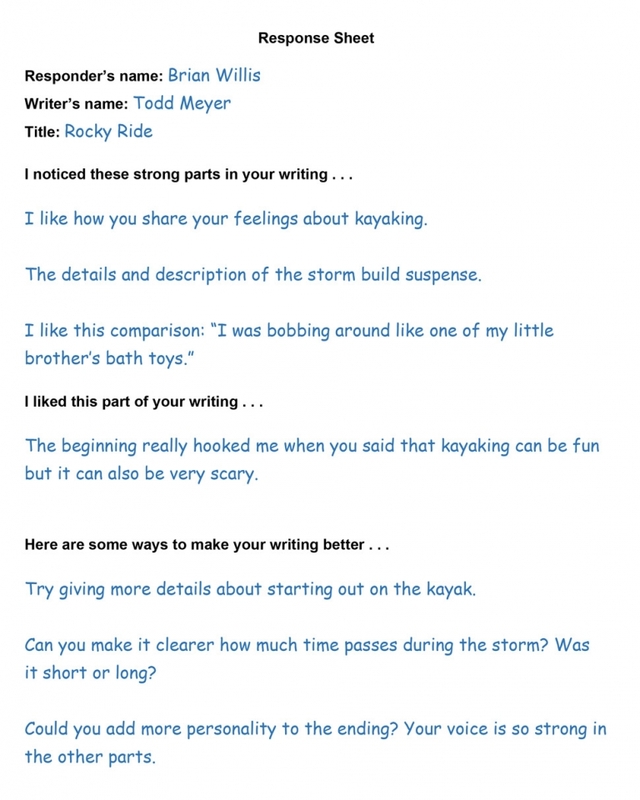 Your Turn Conduct a peer-response session with a writing partner. Each of you should bring a draft that you have written. Take turns in the roles of writer and responder. When you are the responder, complete a peer-response sheet to organize your ideas. Remember to be kind and polite in your responses. Using a Peer Response Sheet by Thoughtful Learning is licensed under a Creative Commons Attribution-NonCommercial-ShareAlike 4.0 International License. Based on a work at k12.thoughtfullearning.com/minilesson/using-peer-response-sheet. From the blog post "7 Steps to a Great Writing Workshop"